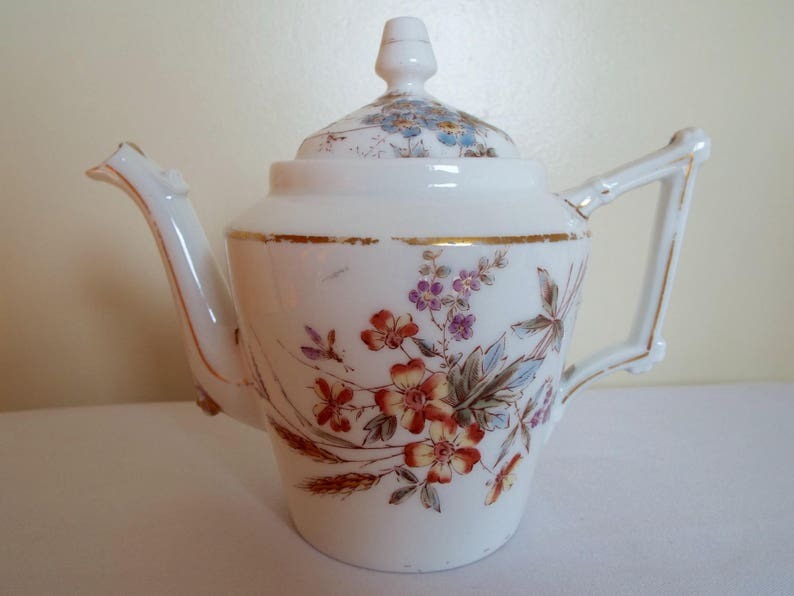 An exceptionally beautiful and elegant transfer printed white Victorian French teapot with hand painted colouring, with a Limoges mark. Dating to roughly the late nineteenth century (probably 1880s or 1890s), this small teapot is often referred to in England as a 'bachelor teapot'. This is due to its small size, making it perfect for brewing tea for just one person. However, it does hold around 3 cups well (depending on size of teacup used), so its ideal for a pair of people to share, perhaps for tea time with a friend. It is beautifully decorated with high summer wild flowers, foliage, ears of wheat and stunning little butterflies, all hand painted with wonderful colours on top of their transfer pattern. It is very reminiscent of French fields and countryside on a beautiful summer's day. The Limoges mark can be seen underneath, along with a word I cannot make out. The exceptionally elegant shape and pastel coloured beautiful hand painted flowers and butterflies, mean this teapot would look fantastic on display in a vintage styled home, kitchen or cabinet. Its easy to imagine it being used in a Victorian French, English or European parlour - Limoges was so sought after that its high quality pieces were popular throughout Europe. The shape is very striking and unusual, as is the shape of the squared off spout. This is such a strikingly eye catching teapot - it would be the talking point of any teatime and would look fantastic displayed with other teapots, vintage china, or other Limoges pieces. Crucially, it is an amazingly good pourer! Please ensure you check the dimensions of the teapot below, before ordering. In good vintage condition - something which is hard to come by in a vintage teapot! There is no tea staining inside the pot or crazing to the glaze in areas inside or out. The main sign of use and age is the all-over obvious wear to the gilding, which has rubbed away in many places, but this has left a lovely antique feel and patina which reflects that this teapot is significantly over 100 years old! There are no cracks and the only chip is a tiny flea bite out of the notch on the underside of the lid which keeps the lid on the pot more securely. This can barely be spotted and is of no detriment to the useability or appearance of this teapot whatsoever. Any further wear is commensurate with age and use - please remeber this item is a used antique and a special piece with history. Just ask if you would like any further photos. Holds 410 ml (approx), equivalent to around 3 teacups worth (depending on size of teacup used). Or about 14 3/4 Fluid ounces imperial. Or around 14 US Fluid ounces. Height from foot to top of lid handle: 14.3cm (5 5/8 inches). Approx. Width from spout tip to furthest outer edge of handle: 17.8cm (7 inches). Approx. Your teapot will arrive carefully packaged and wrapped in vintage style brown paper and ribbon. Please see my other listings for examples of my gift wrapping, as I've used all my photo slots to show the beauty of this item. Due to the size and shape of this item, combined shipping may not always be possible if ordering other items alongside this teapot. Rest assured the safe delivery of your items at the fairest postage price is my priority for your order. POSTAGE METHOD: Due to value, this teapot will only be sent 'signed for 1st class' to a UK delivery address and 'signed for and/or tracked' to international addresses (depending on availability in destination country). Vintage Pink Tea Pot And Matching Sugar Bowl And Creamer. Vintage Avonware Teapot With Cottage Garden Design - Holds Two Cups. Very Cute! Vintage Midwinter Jam And Butter Dish. Preserves Dish With Pink Roses and Gold Chintz Pattern. Ideal for Afternoon Tea Or Breakfast In Bed! Vintage Toast Rack Or Toast Tray, Green And White. Art Deco Toast Rack With Two Slots And Butter And Jam Dishes. Ideal For Breakfast In Bed! I love this Tea pot. Arrived all carefully wrapped. I had no problems with shipping. I would recommend to buy from this shop.